SEOUL, Sept. 18 (Yonhap) — In an unprecedented provocation, all of Japan’s overseas missions are uniformly conducting public relations campaigns to claim South Korea’s easternmost islets of Dokdo, officials here said Tuesday, indicating that a countermove by Seoul is under way. “All of Japan’s overseas diplomatic missions are in the midst of an extensive public relations drive over Dokdo. Such a move is unprecedented and it seems to be a very serious provocation,” said a diplomatic source familiar with the matter. The simultaneous launch of the campaigns by different missions worldwide is considered impossible without the orchestration of the foreign ministry in Tokyo, the source speculated. Diplomatic tension between Seoul and Tokyo remains high following the unprecedented Aug. 10 visit to the rocky outcroppings of Dokdo in East Sea by President Lee Myung-bak, who cited Tokyo’s unrepentant attitude over its brutal 1910-45 colonial rule of the Korean Peninsula as a key reason for the trip. According to sources, Japanese embassies around the world have been contacting major figures from each country’s political, academic and media circles, while sending materials about Dokdo to major institutions. The campaign probably began last week when Tokyo placed ads in its newspapers renewing its territorial claim over Dokdo, they added. Seoul’s officials expect Japan to target the United States for its extensive PR campaign, as it cites a San Francisco Peace Treaty, among others, as the basis for its territorial claim. In the treaty that took effect in 1952, Japan renounced all of its rights, titles and claims to Korea, but made no mention that Dokdo belongs to South Korea. But the treaty mentioned only three South Korean islands out of about 3,000, which means the omission of Dokdo does not affect the island’s status. South Korea is also preparing for an active public relations drive on social networking sites worldwide for Dokdo. Last week, South Korean Foreign Minister Kim Sung-hwan told reporters that his government will run counter ads in Japanese media. 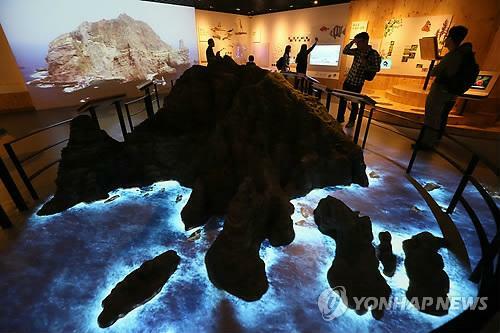 Dokdo, which lies closer to South Korea in the body of water between the Korean Peninsula and Japan, has long been a thorn in relations between the two countries. South Korea keeps a small police detachment on the islets, effectively controlling them. South Korea views Tokyo’s claims to Dokdo as a sign that Japan has not fully repented for its imperialist past and denies Korea’s independence because the country reclaimed sovereignty over all of its territory, including Dokdo, after the colonial rule ended.